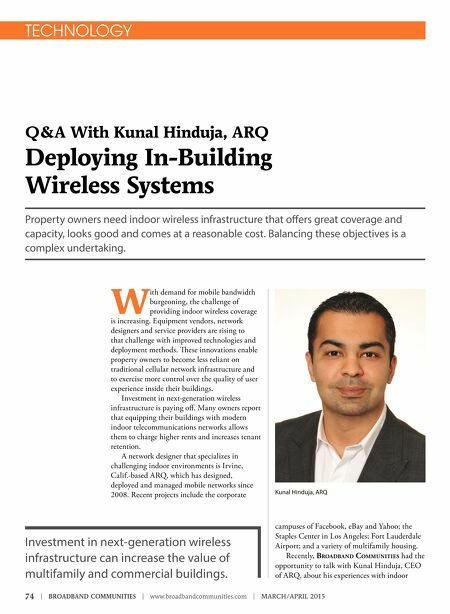 74 | BROADBAND COMMUNITIES | www.broadbandcommunities.com | MARCH/APRIL 2015 TECHNOLOGY Q&A With Kunal Hinduja, ARQ Deploying In-Building Wireless Systems Property owners need indoor wireless infrastructure that ofers great coverage and capacity, looks good and comes at a reasonable cost. Balancing these objectives is a complex undertaking. W ith demand for mobile bandwidth burgeoning, the challenge of providing indoor wireless coverage is increasing. Equipment vendors, network designers and service providers are rising to that challenge with improved technologies and deployment methods. Tese innovations enable property owners to become less reliant on traditional cellular network infrastructure and to exercise more control over the quality of user experience inside their buildings. Investment in next-generation wireless infrastructure is paying of. 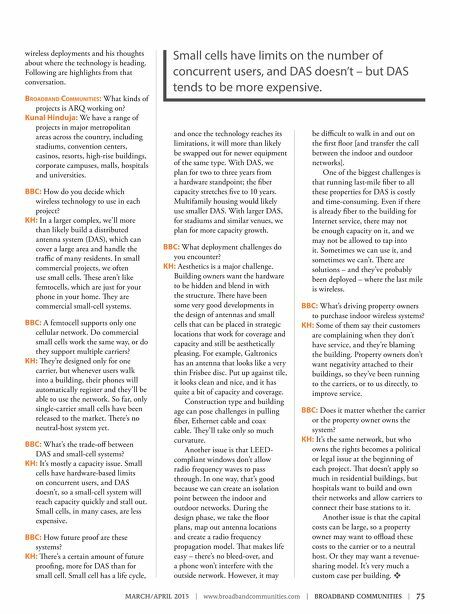 Many owners report that equipping their buildings with modern indoor telecommunications networks allows them to charge higher rents and increases tenant retention. A network designer that specializes in challenging indoor environments is Irvine, Calif.-based ARQ, which has designed, deployed and managed mobile networks since 2008. Recent projects include the corporate campuses of Facebook, eBay and Yahoo; the Staples Center in Los Angeles; Fort Lauderdale Airport; the Las Vegas Convention Center; and a variety of multifamily housing. Recently, BroadBand Communities had the opportunity to talk with Kunal Hinduja, CEO Kunal Hinduja, ARQ Investment in next-generation wireless infrastructure can increase the value of multifamily and commercial buildings.